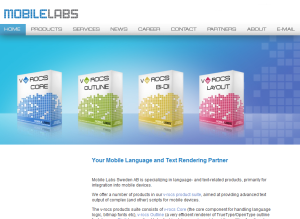 Mobile Labs provides leading edge language and text solutions for mobile devices based on bitmap, outline fonts and language logic for complex scripts. Anders started off as co-founder and CEO, then also handling product management, marketing, sales and webmaster. After leaving the role as CEO, he became chairman of the board. He is no longer owner nor active in the company.